The spaces that we inhabit and interact with on a daily basis are made up of hidden layers of cultural activity that build up (quite literally) over time. While museum exhibits and history texts represent this cultural heritage, they don’t allow the public to meaningfully engage with place-based heritage . In addition, traditional museum exhibits rarely explore the two-sided nature of cultural heritage: the basic information about objects or locations on one hand, and the process by which scholars have reached those conclusions on the other. In short, the exciting scholarly narrative of cultural heritage is often hidden from the public. Developed as a collaboration between the Cultural Heritage Informatics Initiative, the Michigan State University Campus Archaeology Program, and MATRIX: The Center for Digital Humanities and Social Sciences, msu.seum allows people to interact with the rich cultural heritage of Michigan State University’s campus, and understand how the MSU Campus Archaeology Program helped uncover it. 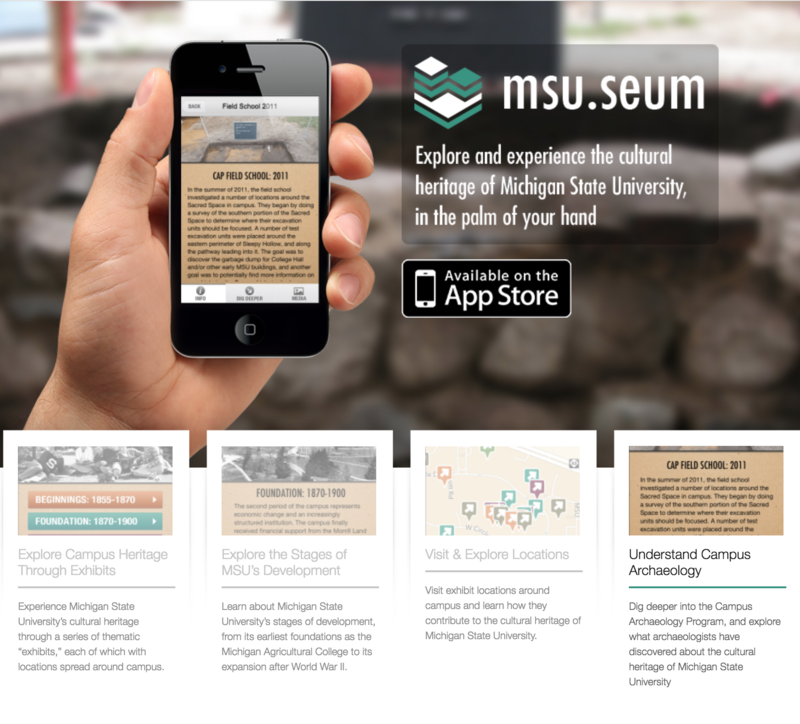 Built on the idea of “campus as museum,” the app connects cultural heritage directly to place, letting people explore what is known about the cultural heritage of MSU, as well as the rich and exciting story of the archaeological and historical research.